I hope you enjoy this cream puff recipe. They taste like you spent all day making them. Make the vanilla pudding first (recipe below) - let cool a bit and spoon into a resealable bag. Place in the refrigerator to set; approximately 45 to 60 minutes. PREHEAT oven to 400 degrees. Cut a piece of brown paper grocery bag and lay it flat on top of a baking sheet. Parchment paper also works. DO NOT GREASE. In a large pot, bring the water and butter to a rolling boil and pour into your mixing bowl. Add flour all at once and IMMEDIATELY mix on medium until dough forms and is starting to stick to the side of the bowl; approximately 2-3 minutes. Add eggs, one at a time, mixing well after each addition. Add vanilla extract, sugar and salt. Continue to mix until dough is smooth and shiny. Drop heaping tablespoons of dough onto the prepared baking sheet and bake for 20 minutes or until golden brown. Immediately poke a small hole on each side of the puffs to let the steam escape. Once puffs are cool, bring out the whipped cream or homemade pudding mixture and cut about 1/8 of an inch off the tip of the resealable bag. This way, instead of trying to spoon the mixture into the cream puffs by hand, or transferring the mixture to a pastry bag, you can directly pipe the mixture into the puff. Be sure to cut only an 1/8 of an inch or so off the bag to ensure maximum control of the amount of filling you're putting into the puffs. Fill the mixture from the bottom of the puff by making a tiny incision (I used the tip of a steak knife), that way the puff will remain whole and look more appetizing when served (as opposed to slicing it in half and filling it like a sandwich). Also a light dusting of powdered sugar and a drizzle of chocolate syrup on top adds a scrumptious accent. I use this vanilla pudding in my cream puff recipe. You may use boxed pudding if you wish - but why? Great for pies too. Combine the sugar, flour and cornstarch together with a whisk in a heavy saucepan. Add the egg yolks, but do not mix yet. Gradually add the milk and stir all together thoroughly with a whisk. Place pan over medium heat and cook until thick and smooth; stirring constantly with a whisk. Remove from heat and add the butter and vanilla. Mix well. Put into bowls. Follow pie recipe is used for pie or any other dessert. 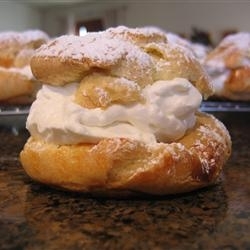 This is another cream puff recipe that is easy to put together and so addicting. PREHEAT oven to 400 degrees and grease a jellyroll pan. Bring water and butter to a rolling boil and add the flour and beat eggs in; one at a time. Spread this into your prepared pan and bake for 25-30 minutes; cool. Now beat the pudding, milk and cream cheese together and spread over the cooled crust. Spread whipped cream over the top and drizzle with the chocolate syrup. NOTE: You may also make this with 1 pkg chocolate and 1 pkg of vanilla pudding. This is a luscious and easy dessert recipe. Place first four ingredients in a saucepan and stir to combine over low heat. Turn up to medium heat and start to whisk constantly until mixture thickens and begins to simmer. Remove from heat and add vanilla extract. Serve warm or cover and refrigerate until serving.